History, science, and music are three subjects that don’t normally intersect, but for Stephen Houpt they are a way of life. 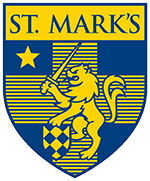 After years of cultivating his musical passion, the St. Mark’s physics teacher has been performing to live audiences and has recently released an album. Stephen garnered a deep interest in Chinese poetry, reading translations from the ancient Tong Dynasty at his local library. He later purchased a steel guitar and fused his love of music with his love of poetry, writing songs based on the Chinese translations. Eventually, Stephen began writing his own poems, based on his own life experiences, and put them to music. When a new neighbor moved in across the street, Stephen found a collaborator in vocalist Amy Elhoff Harms. Last year, Stephen and Amy released an album titled Hey Neighbor which features original songs written by Stephen, as well as a few adapted from Chinese poetry. “Being a teacher has informed me as a musician,” Stephen said. “When you’re a teacher, to a certain extent you’re a performer. I’m more comfortable playing to an audience because I’ve been teaching for almost 40 years. 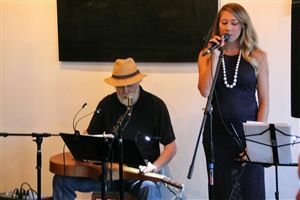 The pair has performed several times at The Wine Therapist lounge in Dallas. Stephen Houpt and Amy Elhoff Harms perform their music.